Hello all, At this current time I have Multiverse installed, BUT this causes my server to crash as there is no 1.2.5 version which is compatible for Tekkit, So I was wondering do you know any other plugin that works the same. *- I would like the portal feature *- I am currently running version 3.1.2 of Tekkit Thanks in advance. I am getting some errors in the log file, Could you explain please? Server Crashes, INCLUDES ERROR LOG! Pixlepix, We would reward you with what you bring to us, E.g the work you. & A server with custom plugins always stands out from a crowd. Yes, I know exactly what all this takes, I am willing to go that extra mile to be the best. I do apologize, I forgot to list plugin modification/creation. & Programmer(Managing a server backend). We are looking for someone who can do the following: Looking for errors found in logs, Managing plugins (Setting them up/configs etc) Work with code around the server backend Configure within the backend of the server. You sound rather promising, Do you have Skype? We are running 22 plugins, Only around 12 of them are main and need abit of work. Please could you send some evidence from your previous work? 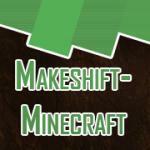 Hello all, I am Mayo_009 owner of Makeshift-Minecraft who are a good SMP Tekkit server looking for someone to manage plugins. Daily we acquired 60+ players until running into technical difficulties where we was down for a few weeks, Now we are just resuming and have obtained over 300 unique IP's within 1 day. We thought you could come in helpful with: Looking for errors found in logs, Managing plugins (Setting them up/Configs etc) & more along those lines. We would also like (if you have any) links to previous work, etc (plugins, servers worked on. Just to give us a little thumbs up! If you would like to know more or would like to offer yourself simply just comment below or add me on Skype: Mayo_009 Thanks. Thanks for that feedback, I also read the other thread. I have disabled inventory throttle and chunkunloader was already disabled so I shall come a look out on the results, Once again thank you very much! Hello guys, Well I run a Tekkit server & I have both 100% CPU and Memory all the time. The first thing I would like is a diagnosis from what the console produces on the crashes which is located below. Also is there any plugins/mods to install that could potentially fix these crashes. My server has 6GB Dedicated RAM & we have 144 player slots and average around 50-80 players. Plugins: - Essentials - TekkitRestrict - LagMeter - LogBlock - WorldEdit - WorldGuard - LWC - Multiverse-Core - Multiverse-Portals - iConomy - MCBans - PaidRanks Console message upon server crash: http://pastebin.com/SjFzGN0c All feedback will be greatly appreciated.